At Lawndale Veterinary Hospital, we examine and treat pets for all types of things – from routine wellness exams to sick pets and emergency situations. Around the holidays, we seem to see an uptick in pets with vomiting and diarrhea. Wondering why that might be? While there is truly a long list of reasons why a pet might develop vomiting or diarrhea, we’ve pulled together some of the more common scenarios that we often see around the holidays (of course – these are possible any time of year!). Want some good news that might save your pet a trip to the vet for vomiting or diarrhea? Then be sure to check out our ‘Avoidance Tips for Pet Owners’ included below! Gastroenteritis: This is a general term that is used to describe inflammation in the gastrointestinal tract (stomach and/or intestines). The inflammation can cause vomiting, diarrhea, and decreased appetite. There are multiple possible causes for gastroenteritis (for example, viral, bacterial, medications, parasites). Sometimes we can attribute it to eating something the pet doesn’t normally eat (for example, table scraps handed out from the Thanksgiving dinner table, the pet sneaking into the trash can), and it can also be caused by changing the pet’s food to a new brand or flavor too quickly. Of course, many dog owners also recognize that their dogs may decide (for whatever reason) that something like rabbit or goose poop is worth ingesting. Keep trashcans where pets can’t get into them. Change diets slowly, over 5 to 7 days, if you are switching your pet to a new diet. Keep your pet in his or her crate or in a different room when everyone sits down for a holiday meal. 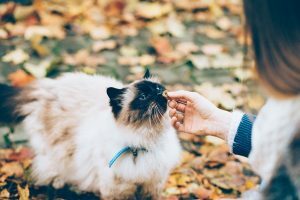 Keeping your pet on a leash outdoors, and using distraction techniques (followed by praise for good behavior) can help turn your dog’s attention to you instead of eating whatever they might find in the grass. Pancreatitis: The definition of this word sounds pretty straightforward: inflammation of the pancreas. However, pancreatitis is unfortunately one of those conditions that may not always be straightforward to diagnose (or to treat). Pancreatitis can present as an acute illness, but it can also be a chronic problem. The pancreas is the organ that sits next to the stomach and duodenum, and it produces digestive enzymes as well as insulin. Normally, the digestive enzymes from the pancreas travel through the pancreatic duct into the duodenum where they are activated to help digest food. In an episode of pancreatitis, the digestive enzymes basically become activated too soon, and the enzymes start digesting the pancreas. The symptoms of pancreatitis might include a decreased appetite, vomiting, diarrhea, decreased energy, fever, dehydration, and abdominal pain. Pancreatitis can range from mild to severe (even life-threatening), so some pets can even develop additional problems and complications. Often, we do not know what the underlying trigger is that causes the pancreatitis. In some patients, we might see an association with the ingestion of high fat foods and pancreatitis. Don’t feed table scraps – especially foods that are fatty. You can find a list of human foods that could be safe for your pet here. If your pet develops any of the signs mentioned, have them examined by a veterinarian. The sooner we make the diagnosis, the sooner your pet can start feeling better. Keep your pet’s routine as close to normal as possible even when houseguests come or you travel with your pet. Make sure to spend one-on-one time with your pet each day so they can look forward to that playtime together. If your pet is stressed with houseguests, give your pet a safe place to retreat. Offer interactive and engaging toys to keep your pet entertained, and be sure to rotate the toys often. If your pet has a tendency to develop intestinal upset when boarding, make sure you take your pet’s regular food with him or her to the kennel so they don’t have to switch to a different diet while boarding. Be proactive in discussing your pet’s anxiety with our veterinarians. 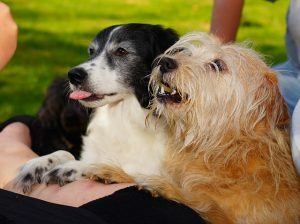 Once we understand your concerns we can help come up with a plan to decrease your pet’s stress! Toxic Ingestion (Plants, Human Foods, Medications): When pets eat things that are toxic or harmful, they can display a variety of signs and symptoms. Vomiting and diarrhea are certainly some of the more common signs we might see with many toxic ingestions. Be mindful and cautious during the holiday season – with gifts coming into the house, someone could accidentally bring something that could harm your pet. Always check whether a plant is toxic before placing it where your pet can access it (Download the ASPCA’s app here). Keep in mind that a number of human foods can be toxic to pets. Never give your pet anything if you are not sure it’s safe (Learn more here). Never leave medications (especially flavored ones!) where curious pets can find them. Never give your pet any medication that has not been prescribed/ recommended by your veterinarian. It’s no surprise – we all know that dogs and cats will eat things that aren’t even food! If you have a pet that likes to eat non-food items, hopefully you have found ways to keep things out of reach already. Just remember that when the holidays come and guests and gifts appear, you still need to make sure things are out of your pet’s reach. Also, remember that bones can cause gastrointestinal blockages in pets. 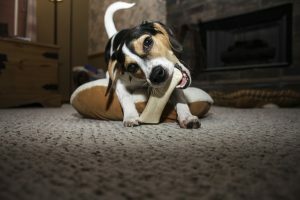 Furthermore, the splintering that occurs when pets chew on the bones can damage the mucosa of the intestinal tract after the bone fragments are swallowed – so it’s best not to let your pet have the bones from the turkey or chicken! Don’t leave items lying around on the floor for curious pets to find. Always supervise your pet with a toy to make sure he or she is not eating parts of the toy. Remember that some pets (especially cats) will eat strings, ribbon, rubber bands, and tinsel. These items can become lodged in the gastrointestinal tract and cause severe problems for the pet (often requiring surgical removal). Holiday gifts for kids are always exciting, but be sure to help children understand the importance of picking up their toys when they are finished playing with them.